Dubai, UAE, November 03, 2018: It's the season to be gorgeous! The festive season is here, and there's magic in the air. It's the time to look your best for those glamorous late-night events and fun-filled festive parties with family and friends. And while a little sparkle on your outfit would be a perfect way to go about it, you'll need that glow on your face to go with it. In this busy time, the chances are that you're not going to find the time for your usual skincare routines. So, the next best thing is to use a sheet mask as a highly concentrated quality sheet mask works like a charm and can quickly help prep your skin for a long-lasting glow every single time. 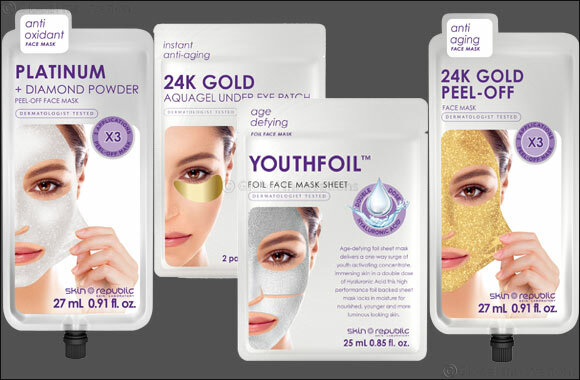 Skin Republic's face masks are ideal for the holiday season for an instant fix and even for a festive feel & look thanks to its range of luxury metallic masks.